Hello and welcome back to the 365 blog - with all festive supplies stashed away again for another 11 months, I have turned my thoughts back to these monthly regular posts. I (Claire N) have decided to run my next 12 monthly posts (on the 7th of each month) with a theme, so I hope you enjoy and follow along. The main theme I'll be working to, is crafting on a budget. I think there will be something for everyone, maybe you have decided the New Year is the time to start crafting, or you have decided (as a crafter) that this year you will be more economical with your supplies and are determined to use all your scraps before buying new paper pads. 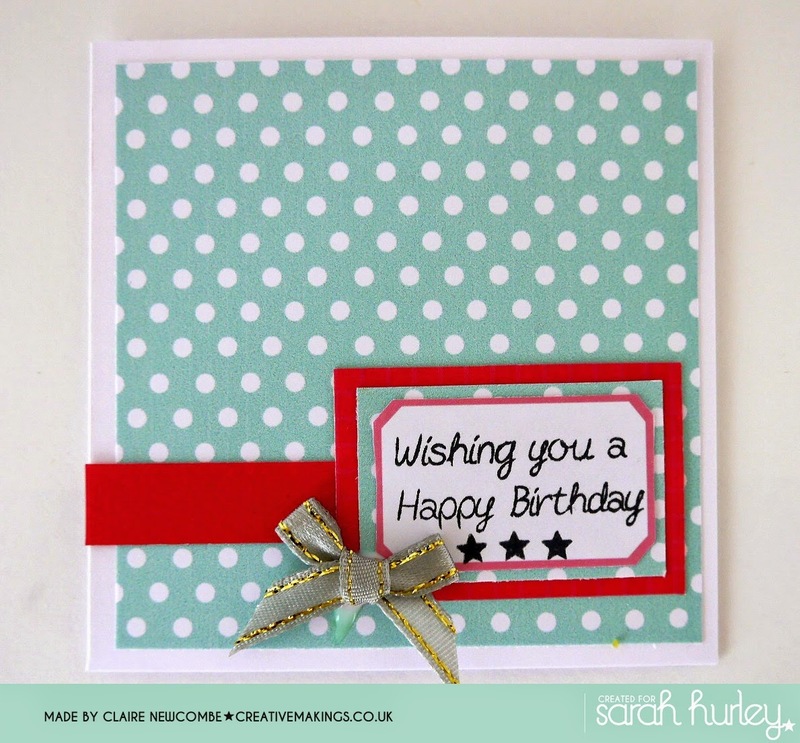 All the cards made share the fact that the main focal image is actually the sentiment, stamped onto the labels that can be downloaded from Sarah's website. Simple card blanks - a pack of 50 card blanks & envelopes can be bought for about £6.50 (13p per card & envelope). You may be able to find smaller packs that cost less! Paper scraps & offcuts - Crafters will have endless boxes, but as a beginner, save packaging/labels etc, if a pattern strikes you and the paper/card is in a fairly good condition keep it! If you buy from Sarah's shop, sometimes the packaging includes some lovely teal blue tissue paper. ideal to add to cards. But if you don't have any, you can download some printable papers from Sarah's shop. again seasoned crafter will have plenty. But as a beginner, use buttons laying around your home, salvage sparkly/pretty embellishments from other greetings cards. How about looking at your clothes, have any of your jumpers got lengths of ribbon in the shoulders that get in the way? - snip it out and use on your cards (I do it all the time!) Alternatively Sarah has grab bags of embellishments in her shop ranging from £3.50 to £5. The cards pictured show a representation of the some of the embellishments in these bags. Cutting Stationary (Sharp scissors or craft knife, steel ruler and self healing mat) - Use what ever you are comfortable with initially. To sum up, if you are a beginner, for an initial outlay of £20 (an additional £12.75 will get some optional extras) you will have more than enough supplies to make these 5 cards, and more. Card is 3.75" square, backing paper is 3.5" square, red layer behind sentiment is 2"x 1.25"
For Beginners - The sequence of events stamping your sentiment. Peel the stamps from the plastic sheet, and put onto an acrylic block. If you don't have one use anything clear and plastic, for example a plastic ruler, the lid of a CD case etc. 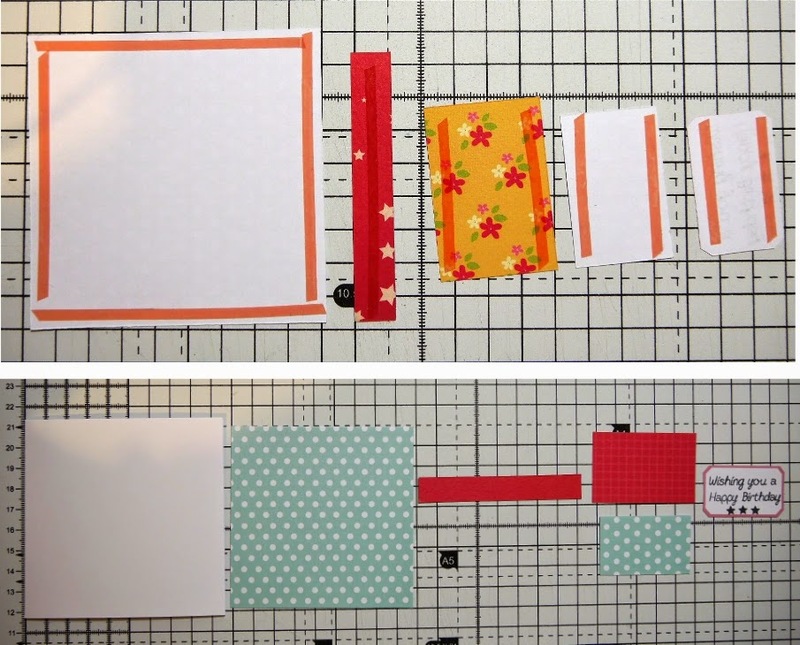 For Beginners - on the reverse of each cut element line with the red double sided tape (top). The lower photo shows the order in which the elements should be applied to the card. I've heard that colour blocking is fashionable in clothes, well I wouldn't know about that LOL! but it is a good look to create a card for a teenage boy. For Beginners (card is 4.75" square)- Just wanted to show how to finish the card with a small few stamped accents, using both the stamp set and inks listed at the top of the page. 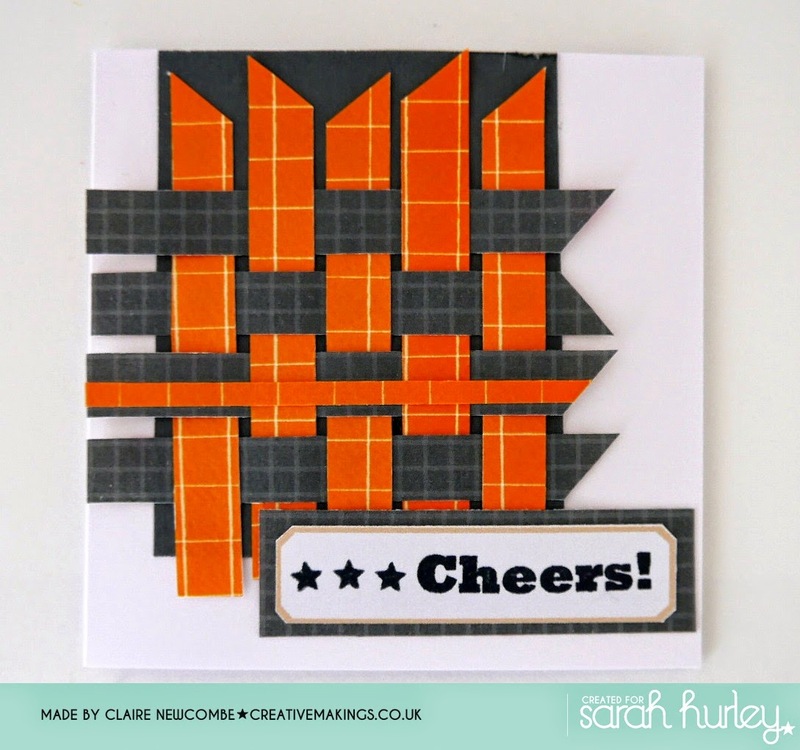 The stamp set is so versatile, and the finishing touches really 'jazzes' up your project. Do you remember paper weaving, it is a perfect way to use up, those smaller scraps of paper and add some interest to a small card. A very simple card, but clean and effective and lets you use 2" squares of co-ordinating paper as a backdrop to the stamped hearts and sentiment. 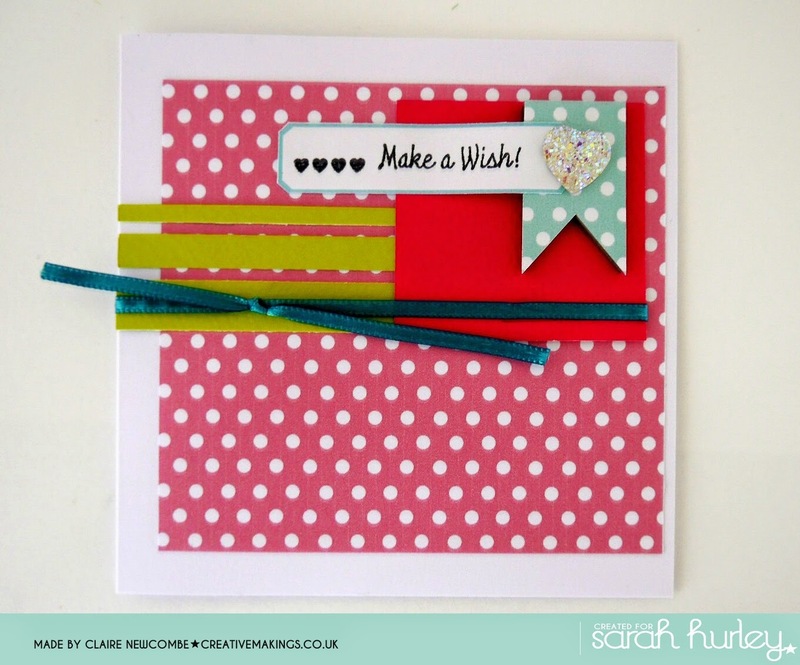 This is a bold card with striking colours, and a bit of dimension from the 3D glittery heart. The ribbon has been recycled from one of my lightweight summer tops. For Beginners - this card is 4.75" square, with the main pink backing paper being 4.25" square. To keep things simple the dimensions of the other elements isn't essential, you can cut the pieces to the size that looks good for you. This craft is all about personal taste and that is what adds the uniqueness to each piece you create. I hope that I have been able to encourage those new to this craft to give it a go. I wanted to show you do not need to spend too much on materials, to be able to create something fun and vibrant, for all number of occasions for both males and females. Making the right initial purchases is key, and if you are able to follow me through the months I will start adding in further supplies and also showing you how to get the most out of them too. For you seasoned crafters, who have persevered to this stage in the post (thank you LOL), I hope I have given you a few ideas on how to use use up those scraps of paper, and also how going back to the basics of card making, and focusing on sentiments, can produce sweet little fun cards. All of us with this hobby want to get the most out of the supplies we buy, and over the coming months I hope to be able to demonstrate different style of cards that can be made from one stamp set, or paper set etc. See you again next month, and I've introduced theme, I promise the next post won't be such marathon..hehe. Thank you carol, well done for being the first one to make it to the end.... Got a bit carried away, bit of a marathon isn't it? LOL!